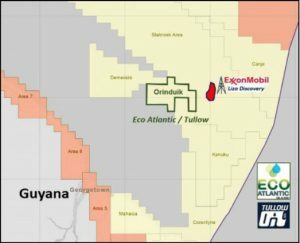 Toronto, June 8th, 2017 – Eco (Atlantic) Oil & Gas Ltd. on Thursday announced that Eco Atlantic and its Operating Partner, Tullow Oil, have approved an estimated 2,550 km2 seismic survey on the company’s Orinduik Block offshore Guyana. The survey is anticipated to commence in the next two weeks. The survey will be completed by Schlumberger Guyana Inc. (Western Geco) in an area not far from where United States oil giant, ExxonMobil, has found commercial quantities of oil at Liza and Payara. Eco Atlantic (Guyana) Inc, a subsidiary of Eco Atlantic, holds a 40% Working Interest in Orinduik, and Tullow, the Operator, holds the remaining 60%. The Orinduik Block is located up dip and just a few kilometers from Exxon’s recent Liza and Payara discoveries confirming, by Exxon’s estimates, in excess of 1.5 Billion Barrels of recoverable oil. The Company and Tullow have completed the first phase of exploration including evaluating all existing and regional 2D data. Following the results of this study and the ongoing regional success, both parties have agreed to accelerate and significantly increase the originally proposed 1,000km2 3D survey commitment on the block to circa 2,550 kms2, thus covering the entire block area, fully overlapping current prospective 2D leads and downdip trends. As part of its agreement with Tullow, Tullow will carry the Company’s share of the originally proposed 1,000 km2 of the survey, at a cap of US$1.25mm, with the balance of the program being funded by both parties on a pro-rata basis. The additional cost of the enhanced seismic program to Eco is well covered by existing cash resources following the Company’s over-subscribed Placing of 5.1 million British pounds sterling announced in February 2017 in conjunction with its dual listing on the AIM market of the London Stock Exchange. Colin Kinley, Chief Operating Officer and co-founder of Eco Atlantic commented: “We are excited to embark on this very significant 3D survey which is substantially greater than the originally planned survey. In addition to de-risking the existing two defined targets, the survey will hopefully generate additional targets on the Orinduik Block, thereby increasing the prospective oil in place and adding leads for future work programs. We were keenly interested in this region of the Guyana-Suriname Basin even prior to Exxon’s highly successful drilling program, applying for the Orinduik block in 2014 because of its highly prospective Cretaceous canyon and fan plays. We have since been excited to see Exxon continue to successfully prove out the region in its ongoing drilling program and look forward to results from our own 3D survey, which are expected to come in the next couple of months”.